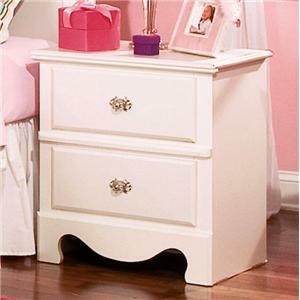 Three drawers in this youth nightstand will offer your child plenty of space to stow a few toys and books away. The spacious top is a great place to add a lamp and decorations. Full extension glides make the drawers easy to use, which is perfect in a child's room. 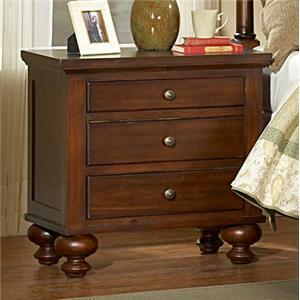 The Jesse Three Drawer Youth Nightstand with Turned Feet by New Classic at Carolina Direct in the Greenville, Spartanburg, Anderson, Upstate, Simpsonville, Clemson, SC area. Product availability may vary. Contact us for the most current availability on this product. 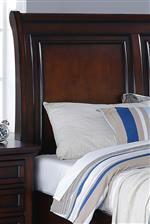 When you bring the Jesse bedroom collection home you'll be adding traditional appeal with versatile functionality. Featuring several storage options, including footboard storage in the low profile bed, you'll have plenty of space in your bedroom to stow clothes, bedding, and any other items you might need. 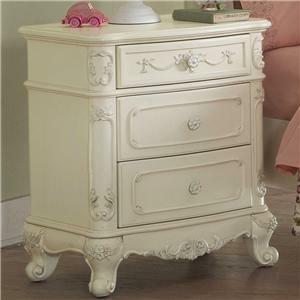 A swivel chest provides both drawer space and hidden shelving for jewelry, while a nightstand with an outlet and USB ports makes it easy to charge your phone overnight. Moulded detailing and turned feet make your space feel more traditional. 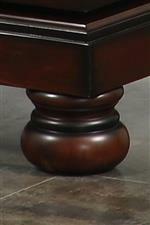 Each piece has a rich Cherry Brown finish. The Jesse collection is a great option if you are looking for Traditional furniture in the Greenville, Spartanburg, Anderson, Upstate, Simpsonville, Clemson, SC area. Browse other items in the Jesse collection from Carolina Direct in the Greenville, Spartanburg, Anderson, Upstate, Simpsonville, Clemson, SC area.